Egbert Benson (June 21, 1746 – August 24, 1833) was a lawyer, jurist, politician from Upper Red Hook, New York, and a Founding Father of the United States who represented New York in the Continental Congress, Annapolis Convention, and the United States House of Representatives, and who served as a member of the New York State constitutional convention in 1788 which ratified the United States Constitution. He also served as the first Attorney General of the State of New York, Chief Justice of the New York Supreme Court, and as a judge and Chief Judge on the United States Circuit Court for the Second Circuit. Benson's ancestor, Dirck Benson, who settled in New York City (New Amsterdam) in 1649, was the founder of the Benson (Dutch) family in America. Egbert Benson was born in New York City, the son of Robert Benson (1715–1762) and Catherine (Van Borsum) Benson (1718–1794). The Benson family was one of the earliest Dutch families to have settled in Manhattan. In a letter written to Arthur D. Benson, Egbert Benson lived at the corner of Puntine and Fulton streets in the home of William Puntine. The house was apparently not numbered until 1907, when it became No. 436 Fulton Street. In 1938, Puntine Street became 165th Street, while Fulton Street became Jamaica Avenue. His home was one of the centers of cultural life in New York City. Benson lived with his maternal grandmother, a widow who lived in Borad Street, at the corner of Beaver, during the early part of his life. Benson was taught in Dutch, and he learned his catechism in that language. Upon reaching a suitable age, Benson attended an English Classical school of repute and prepared himself for college. During this time, he was guided and assisted greatly by the learned and deep-read scholar, the Revd. Doctor Barclay, Rector of Trinity Church. He was privately educated, then attended King's College (now Columbia University), graduating in 1765. He read law, was admitted to the bar and moved to Red Hook in Dutchess County. He practiced law both there and in New York City. Benson was also honored by Harvard and Dartmouth College. Benson had many relatives who were significant in the American Revolution. One was Benjamin Benson, who was a Revolutionary War soldier, a member of the Committee of Correspondence, and a signer of the Articles of Association, or "Association Test", which was preliminary to the Declaration of Independence, at Haverstraw, New York, in May 1775. 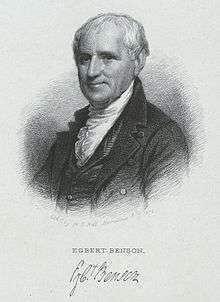 Egbert Benson was the brother of Lt. Col. Robert Benson and Captain Henry Benson, who commanded an armed vessel in the Revolution. Towards the start of the Revolutionary War, Benson approved the course of the Sons of Liberty and gave up, in a measure, his professional prospects then brightly opening and devoted himself to his country: these exertions showed the man's value of this step to both his native state and the cause he aided. He aided the Sons of Liberty, who were in Dutchess County where Benson, as a part of his first efforts, gave proper directions to the political meetings. When the British occupied New York City in 1776, Benson remained in Dutchess County for several years. According to Van Schaack, Benson from 1777 to 1781 served as a member of the New York Assembly and drafted every important bill passed there in during the Revolution. He was also a representative in Congress, from 1780, and drew bills organizing the executive department of the United States. The county made him the president of their Committee of Safety and in 1777 sent him to the revolutionary New York State Assembly. When the first state government was organized, Benson was appointed the first New York Attorney General and served until 1788. He was elected to the Assembly annually until 1781 and again in 1788. During a state dinner in December 1783, given by the State of New York to George Washington and the Minister of France, the bill for the cost of this historic dinner was O.K. 'd/ paid by Judge Egbert Benson and Isaac Roosevelt. New York sent Benson as a delegate to the Continental Congress in 1784. Although he was reappointed in 1785, he did not attend sessions. In 1786, he was named by the Legislature to accompany Alexander Hamilton as a delegate to the Annapolis Convention (1786), which issued a call for the U.S. Constitutional Convention held the following year. He returned to the Congress in 1787 and 1788, and in 1788 attended the state convention that ratified the U.S. Constitution. When the new federal government was established, Benson was elected to the United States House of Representatives and served in the First and Second United States Congresses from 1789 to 1793. In 1794, Benson was appointed a justice of the New York Supreme Court, a position he held until 1801, when President John Adams appointed him to the United States Circuit Court for the Second Circuit. He served as chief judge in that court until 1802. Benson was part of the three-man commission that decided the location of the St. Croix River in 1798. The files and papers belonging to the Arthur D. Benson manuscript collection further state that Benson had a close friendship with General Richard Montgomery. On the back of a criticism, Benson, in his own handwriting, stated: "I knew Montgomery. We were neighbors; and in the closest intimacy for a time until he (was) called to the field. He was a man of sense and worth; the terms taken in their most significant import. As a soldier, his deeds bespeak him truly, the Vir Strunuus." Benson returned to the private practice of law in New York City in 1803. He joined other civic leaders to found the New-York Historical Society and served as its first president from 1804 to 1816. He was the author of several books, including Vindication of the Captors of Major Andre, defending the three American Patriots who captured the spy Major John André, which led to the discovery of the plot to surrender West Point to the British by Benedict Arnold. In 1812 he was again elected to the U.S. Congress as a Federalist but served only five months before he resigned on August 2, 1813. In December 1813, Benson was elected a member of the American Antiquarian Society. His numerous other writings included A Biographical Sketch of Gouverneur Morris (published in November 1816), and Brief Remarks on the 'Wife' of Washington Irving (published in 1819). Judge Benson also wrote and published in the New York American a series of able and highly interesting articles, in condemnation of what he regarded as the absurd and anti-Christian practice of calling the first day of the week the Sabbath. Benson married late in life, on May 17, 1820, to Maria Conover (1796–1867). He died in 1833 in Jamaica, Queens, and is buried in the Prospect Cemetery there. His grave has been designated by a historical marker. His death left John Marshall and James Madison as the only surviving Founding Fathers of the United States. Egbert's oldest brother was Clerk of the New York State Senate Robert Benson (1739–1823). In a small letter belonging to the Arthur D. Benson manuscript collection (found at the Queens Central Library Archives), Benson's great-grandnephew, Hevlyn Dirck Benson, noted that Egbert was the "last important tenant" who resided at the Richmond Hill House, in which the site is now occupied by the Butterick Building. According to manuscripts and notes found in the Arthur D. Benson manuscript collection at Queens Library, Benson's name was engraved on a bronze tablet on the Butterick Building on 6th Avenue and Spring Street in New York City; this tablet was placed there by the Greenwich Village Historical Society. Hevelyn D. Benson, great-grandnephew of Egbert Benson, sent Jerome D. Greene, director of Harvard's Trancentanery, seven photostats concerning Egbert Benson. Hevelyn Benson was also a member of the New York Historical Society, founded in 1804 by his ancestor, Egbert Benson. Benson also included a photostat of an article in The Eagle from September 16, 1935, which designated Egbert Benson as the man behind the Constitution. The state historical marker for Benson's grave was applied to Senator Thomas C. Desmond, a trustee of the New York State Historical Society, by Hevelyn Benson. 1 2 3 Arthur D. Benson Genealogical Notes and Correspondence Concerning Egbert Benson and the Benson Family 1938 Control, manuscript collection finding aid, Archives at Queens Library: "Correspondence" Folder: 179/1 1938-1939: "Letter to Mr. Arthur D. Benson." 29 OCT. 1938. 1 2 3 4 5 6 Arthur D. Benson Genealogical Notes and Correspondence Concerning Egbert Benson and the Benson Family 1938 Control, manuscript collection finding aid, Archives at Queens Library: "Genealogical Notes" Folder: 179/2 1934: Benson, Arthur D. "Alderman Benson's Memoir of the Benson Family: Alderman Benson's Paper on the Benson Family". 1 2 3 4 5 Arthur D. Benson Genealogical Notes and Correspondence Concerning Egbert Benson and the Benson Family 1938 Control, manuscript collection finding aid, Archives at Queens Library: "Genealogical Notes" folder 179/2 1934: Benson, Arthur D. "Alderman Benson's Memoir of the Benson Family: Mr. Van Schaack's Additional Paper. Wikimedia Commons has media related to Egbert Benson. United States Congress. "Egbert Benson (id: B000388)". Biographical Directory of the United States Congress.